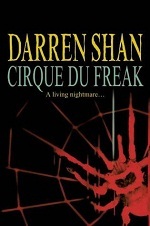 Cirque du Freak is the first novel in The Saga of Darren Shan by Darren Shan. It is part of the Vampire Blood Trilogy, which comprises the first three of the 12 book saga. Cirque du Freak was first published in Great Britain by HarperCollins in 2000, and was later published in the Vampire Blood Series in 2003 and 2004. Cirque du Freak is now a major motion picture. Young Darren Shan has been fascinated by spiders from an early age. His best friend, Steve "Leopard" Leonard has grown up reading horror comics and stories of the Wolf-Man and vampires. After viewing the "Cirque du Freak" Darren and Steve are mesmerized by the fantastic and disturbing show, especially by the act of the mysterious Mr. Crepsley and his giant, deathly poisonous spider, Madam Octa.